Although animals eat all year round, there is no "all season" plant to use as forage. Knowing that some plants are C3 (cool season) and some plants are referred to as C4 (warm season) is a basic key to having quality forage all year long. But understanding the physiology (internal chemical changes) of both can even further improve the management of forages. C4 and C3 plants both utilize photosynthesis which is a chemical process in which light energy from the sun is captured and mixed with water and carbon dioxide to make sugars which are used as food for chemical energy. Sugars become energy. The water is used for cell function and the Oxygen is plant waste. But C3 and C4 plants use different leaf anatomies to carry out photosynthesis. The differences are reflected in how plants take carbon dioxide from the atmosphere and use the components for plant functions. But it should be noted that photosynthesis also is influenced by solar radiation, temperature, water stress, and mineral nutrition. C3 plants are called temperate or cool season plants and reduce (fix) CO2 directly by the enzyme ribulose bisphosphate carboxylase in the chloroplast. The reaction between CO2 and ribulose bisphophate, a phosphorylated 5-carbon sugar forms two molecules of a 3-carbon acid. This 3-carbon acid is called 3-phosphoglyceric acid and explains why the plants using this chemical reaction are called C3 plants. The 3-phosphoglyceric acid molecules move out of the chloroplast to the cytoplasm and are used to make hexose, sucrose and other compounds. The enzyme ribulose bisphosphate carboxylase also triggers a reaction where oxygen splits ribulose bisphophate into a 2-carbon acid and a 3-phosphoglyceric acid. The 2-carbon acid is respired to carbon dioxide and basically a loss to plant function. 15-40% of the light energy taken into the C3 plants is lost in this process called photorespiration. The percentage goes up in higher temperatures, so C3 plants use more available oxygen in cooler environments. C3 plants have an optimum temperature range of 65-75 degrees F (18.3-23.9 degrees C). Growth may begin when the soil temperature is 40-45 degrees F (4.4-7.2 degrees C). C3 plants become less efficient as the temperature increases but have higher protein quantity. The lower temperatures in early spring also affect the existence of other organisms so C3 need nitrogen in the spring because of low microbial action in the soil. Alfalfa, a legume, has a faster photosynthesis rate than most other C3 plants. The protein content of alfalfa leaves is very high and most of the protein is ribulose bisphosphate carboxylase. C3 plants can also be annual or perennial. Annual C3 legume plants include arrowleaf clover, ball clover, berseem clover, vetches, and black medic. Perennial C3 legumes include alfalfa, alsike clover, birdsfoot trefoil, and white clover. The degradation of C3 plants in the rumen of an animal is often faster than C4 plants because of the thin cell walls and leaf tissue and they are therefore often of higher forage quality. C4 plants are often called tropical or warm season plants and reduce carbon dioxide captured during photosynthesis to useable components by first converting carbon dioxide to oxaloacetate, a 4-carbon acid. This gives the reason for the plants being referred to as C4 plants. Photosynthesis then continues in much the same way as C3 plants. But during this type of photosynthesis, the process is very efficient and little oxygen is lost to the environment. Korean and striate lespedeza are considered warm season but their photosynthesis systems are inefficient C3 systems. Alyceclover, kudzu, cowpea, and perennial peanut are warm-season legumes. C4 plants are more efficient at gathering carbon dioxide and utilizing nitrogen from the atmosphere and recycled N in the soil. They also use less water to make dry matter. They grow best at 90-95 degrees F (32.2-35 degrees C). They begin to grow when the soil temperature is 60-65 degrees F (15.5-18.3 degrees C). Forage of C4 species is generally much lower in protein than C3 plants but the protein may be more efficiently used by animals. C4 plants can be annual or perennial. Annual C4 legumes include alyceclover, cowpeas, soybeans, velvetbeans, striate and korean lespedeza. All of the information about warm and cool season plants provide foundation to forage management decisions. 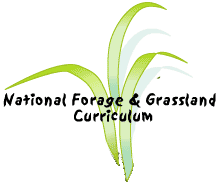 With this understanding, managers can know what they will have during peak pasture growth, what and when to plant supplemental crops, when to harvest, how to prepare the fields for winter, and how and when plant regrowth can be best utilized.